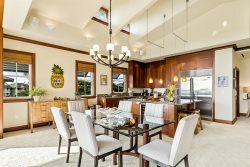 Welcome to C204 at the Point at Mauna Lani Resort – This 2 bedroom, 2.5 bath ocean view villa has amazing views that include the Signature 15th hole of the Mauna Lani South Course, Ocean Views and a view of the lovely black sands of Honokaope Bay. The lanai is furnished with comfort in mind with a full sized sofa and two arm chairs with matching ottomans and a coffee table. The serenity, comfort and views combine to create the perfect location for memorable sunrises and sunsets. The glass doors to the lanai provide you with breathtaking views from the within the villa. The living room is adorned with quality solid wood furnishings and a very unique seashell sectional. A wall mounted flat screen television dares you to take your eyes off of the spectacular view. The dining table seats 8 guests, ideal for entertaining! The mirrored wall of the dining area extends the dimensions of the room with absolute elegance. The custom gourmet kitchen has been upgraded with beautiful koa wood work. The appliances were selected in a classy stainless steel and include your very own personal wine cooler. The oversized granite countertops invite you to create a culinary feast. Both bedroom suites are furnished with king beds and both have their own private bathrooms. The master suite includes a workstation near the lanai for those who prefer to be seated at a desk to catch up on a bit of business. A warm neutral tones of this room, and the wall mounted television create a welcoming space to retire to at the end of the day. The master bath has dual vanities and a spacious custom walk in shower obscured behind a glass block shower wall. The guest suite is also furnished with a king bed, and set in place with a creative oversized wooden headboard. A combination television/dvd player/vcr player can be hidden from view within the doors of closet which also contains built in drawers. An adjacent closet provides room to hang clothing. The guest bath is quite spacious and has a tub/shower. In the entryway of the home is a beautiful half bath, a full size washer and dryer, central air conditioning and ceiling fans throughout. The Amenity Center is located one building away from C204 and has a spacious summer kitchen, barbecue grills and lots of comfortable seating. A water feature flows beside the free form pool, there are outdoor showers, a hot tub and a sauna. C204 guests enjoy access to the gated entry of Makaiwa Bay with the Mauna Lani Access Card. Here you will find Napua’s beachfront restaurant, Mauna Lani Sea Adventure Tours, a gorgeous white sand beach and ancient fishponds.